This is a question I used to get frequently, which comes to mind again now that I will be walking the docks at the U.S. Powerboat Show this week in Annapolis. The answer was pretty simple back in the old days, when a Grand Banks was the bull's eye of the niche, with a few others from North America, and of course the fleet of Taiwan trawlers built in the '70s and '80s during the fuel crisis. Slow, economical cruising boats, they could be found in most every coastal cruising destination in the world. One rarely saw them in the Caribbean, however, or in any of the offshore island groups, unless the boats were based there. The coming of the offshore motorboat had yet to be developed beyond Beebe's Passagemaker and a handful of other custom vessels. Art DeFever designed several trawlers well suited for the open ocean, but it wasn't until PAE launched the Nordhavn 46 that people got the itch to venture far over the horizon. There were a few exceptions, of course, as there always are. A retired couple took their 1976 DeFever Passagemaker 40 to South America and went around Cape Horn in an older design that would look at home at any MTOA or Great Loop Rendezvous. Nothing particularly special about it, except, of course, the man and woman on the boat who didn't think it all that odd. 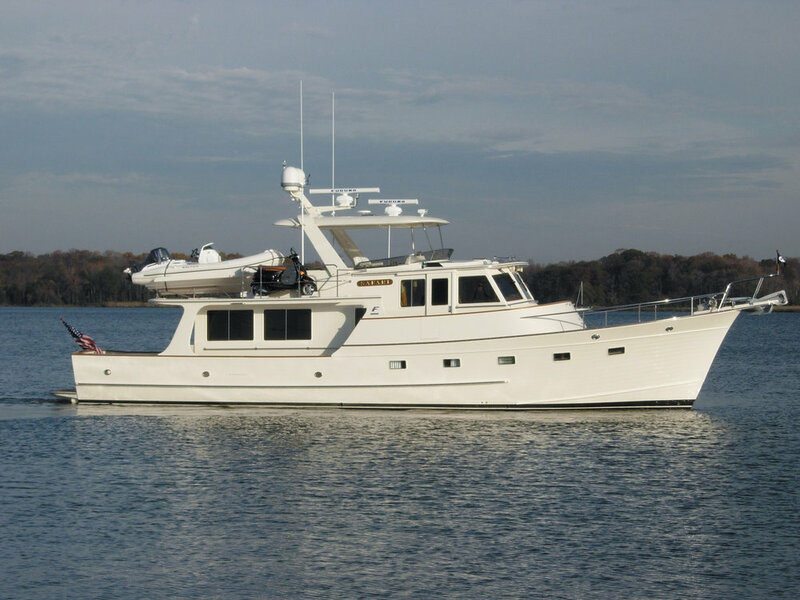 The DeFever Passagemaker 40 was one of the first production trawlers with the DeFever name. After PassageMaker Magazine came out, this began to change. While some of these boats existed before within the larger universe of powerboats, PMM grouped together for the first time those powerboats that were not sportfishing or motoryacht types, but rather cruising trawlers. Just like cruising sailboats, these owners lived aboard and traveled near and far in comfort, safety, and economy. I recall at our first boat show in 1995, one woman told me that "In the war between sailboats and powerboats, trawlers are Switzerland"...as most everyone liked them and were happy they did not throw huge wakes (which made the sailors happy) and allowed owners to explore new lands well beyond home waters. I always found that to be true. Watching a Grand Banks 42 Classic go by, in all its stately elegance, was a lovely sight. A Grand Bank 42 Classic just looks great, with wonderful lines. But all this has changed, partly because the market matured, as more people came into the trawler lifestyle, and their needs changed. More people wanted to shove off but weren't fully retired, so they asked for more speed to cruise during shorter time windows. Many people decided they did not want the extra expense of maintaining brightwork. Some liked the look of expedition mini-ships, or Downeast boats, or motoryachts that broke tradition from classic yachts. I saw a change in my perspective, as well, and began to answer that question differently. Speaking to the camera with Tucker Thompson during a video interview at the Solomons Trawler Fest, I explained to Tucker that the word "trawler" no longer represented a specific boat, hull shape, or look. It was now simply a metaphor, a figure of speech, for the cruising lifestyle in powerboats. I can't tell you how many times I've heard an owner tell me his sportfish has big twin diesel for running out to the canyons at speed, but he and his wife cruise along at trawler speeds...just like a trawler. To him it made no difference because they used the boat as anyone with a Hatteras LRC, Monk 36, or Nordic Tug would. As the years went by, and the market progressed, the boats found at boat shows or Trawler Fest came to be all very different: fast cruisers, Downeast cruisers, traditional trawlers, cruising motoryachts, tugs, power catamarans, even motorsailers. An earlier post from March (http://bit.ly/TrawlerList) was my attempt to list them all. The common element was, and is, that they are all used the same way, mainly to cruise comfortably and safely, and share the experience with other cruisers. For a time, some builders called their boats "fast trawlers," although I don't think that particularly fits today. Some builders, I'm thinking Tony Fleming, refused to use the word "trawler" to describe his Fleming 55, a superior cruising motoryacht that is used precisely the same as all the other boats in the trawler community. But things have changed in the industry. Grand Banks no longer wants to be associated with the word trawler. The brand went from Dependable Diesel Cruisers to Luxury Motoryachts. And this begins an article series about wading through the many forms, shapes, styles, and sizes of cruising powerboats to help you understand and identify the right boat for you. It may or may not be a "trawler"—in the textbook definition of one (if such a definition exists for a recreational motorboat)—but if you use it as a trawler, then go ahead and call it a trawler.